Lion mauls man to death bringing death total to 16, after flood in capital freed animals from zoo and put the city on a panicked lockdown. 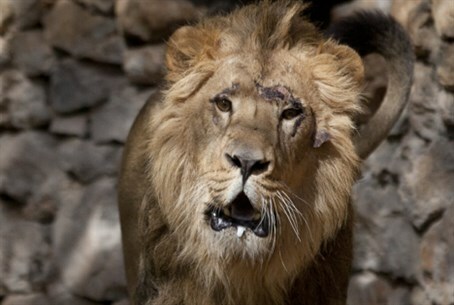 One man in the Georgian capital of Tbilisi met a particularly horrific death, it was revealed on Wednesday, after a lion that escaped from the city's zoo amid massive flooding mauled him to death. The flooding began Sunday, causing the Vere River on whose banks the zoo is situated to overflow. No less than 16 people have died in the disaster, including three zookeepers who tried to rescue animals from the deluge. An interior ministry spokesperson said the lion killed the man near Tbilisi's central square, reports the British Daily Mail. "Police special forces were deployed and are hunting down the animal," added the spokesperson. The flood let numerous wild animals free to roam the streets of the capital in a disaster that has been described as "apocalyptic," and as a result residents have been warned to stay inside as the city remains in lockdown. The beasts running wild include lions, bears, wolves, tigers, a hippo, crocodiles and hyenas, among others. One security guard on Sunday morning was chased through a park at Tbilisi State University by a hyena; he was able to escape the ravenous animal and lock himself in a shed, from where he called police who came and shot the hyena to death. Zookeepers say that of the roughly 600 animals that had been in the facility, over half died in a "hellish whirlpool" or else were put down by the police. Critics say the animals did not need to be killed in some of the cases. In one incident, an enormous and potentially lethal hippopotamus was shot with a stun dart and captured in a central square of the city. Amid the mayhem, Georgian Orthodox Church head Patriarch Ilia II blamed the former Communist regime for bringing the disaster, reports the Interfax news agency. "When communists came to us in this country, they ordered that all crosses and bells of the churches be melted down and the money used to build the zoo," he said. "The sin will not go without punishment." The recent construction of a controversial road, which cuts through the zoo and neighboring Mtziuri park, has also been blamed for causing the Vere to burst its banks. But the BBC cited an engineer-geologist from the ministry of environmental protection, Giorgi Gaprindashvili, who brushed off this possibility. "In the 1960s the same area got flooded. Back then of course there was no highway there," he said.